Marina went to Castres in France to visit the Christmas Market. She has written about the experience and has offered to post it here in the blog. Thanks for posting this mini-article, Marina! Two years ago, on Xmas I travelled to Castres, a medium size city in South East France, to visit a typical Christmas market and I discovered it is a fascinating city where I had never been before. In these pictures, you can see old buildings near the river Tarn. Some of them are wood made and others are painted in several colours. As you can see, all of them have an opening door to the river. In the seventeenth century, furriers, weavers and dyers used to live there (people who work with leather, wool and staining clothes respectively). All of them needed water for their jobs so they used to take their leather, wool and clothes in the river’s water and then they dried it on upper floors. In Castres, there is a small but also very interesting Spanish art museum: The Goya museum. It’s in a part of the Town Hall that had been a bishop’s palace. It was built in the seventeenth century in neoclassical style. There you can find some paintings by Goya, Velázquez, Pacheco, as well as some works by Picasso and Miró. Behind this building there are gorgeous gardens similar to Versailles. In fact they were designed by the same landscaper. 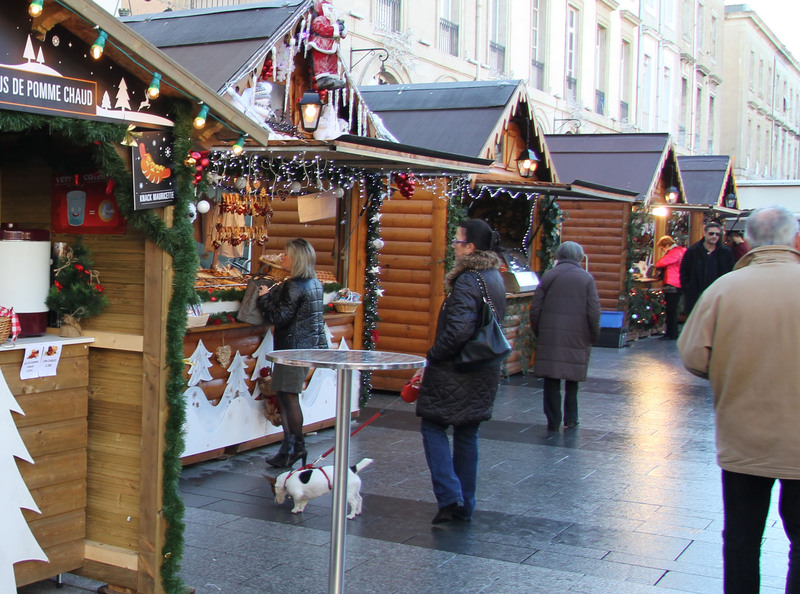 In these pictures, you can see the Castres Christmas market day and night. There are many similar stalls occupying the whole square. In them you can find whatever you want for the Xmas presents, like candles, soap, lights, dolls, little bears… as well as something to eat and drink there (I was very surprised to see that in many of these stalls they were selling oysters!). All of these market stalls are wooden made and have typical Xmas decoration. At night, with all the lights on, the place looks wonderful. This is one of the typical drinks you can buy in this market: “vin chaud”. It’s a hot drink, made with red wine, some fruits and spices. To prepare it, you need some time: first of all, you have to take a pot and put into it red wine, some little pieces of lemon and orange, sugar, cinnamon and other spices. After that you have to cook this mix slowly for an hour. Finally you get a sweet drink that has to be drunk warm.